True to her naval training, Kathryn Thomas never backs down from a challenge. After fulfilling her childhood dream of becoming a helicopter pilot, she suffered an injury that would require her to medically separate from the United States Navy. “I went from achieving my dreams and goals to thinking I was nothing. I lost my identity of being a pilot,” explained Thomas. As part of her recovery, her physician recommended she try yoga to heal her physical and mental well-being. “While I was on my mat for that hour, I focused on what I could still achieve,” she said. This experience inspired Thomas to help others also dealing with life-changing or traumatic experiences. Thus, Yoga 4 Change was born. Yoga 4 Change is a non-profit organization that helps veterans, incarcerated individuals, vulnerable youth, and those dealing with substance abuse in the Jacksonville/North Florida area. Through her yoga teachings, she encourages people to rediscover their own strength and abilities. What makes Yoga 4 Change so effective is the sense of unity and togetherness that Thomas establishes in her classes. Thomas has found that building a community and a sense of togetherness is especially helpful for veterans making the transition to civilian life.“It’s really hard,” said Thomas. 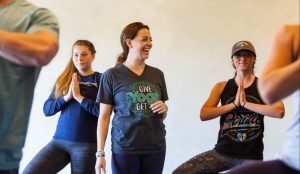 “You don’t know how hard it is until you go through it, and people really downplay that transition.” Along with creating a sense of community, her classes strive to teach veterans to accept themselves on the mat, which then becomes acceptance of themselves off the mat. “I want every veteran transitioning out of the service to know they’re good enough to do whatever it is they want to do,” Thomas said. Ready to unroll your own yoga mat? Find an event near you! Learn more about Kathryn’s powerful story and how she’s transforming lives every day. This entry was posted in Entrepreneurship, Live, News. Bookmark the permalink.